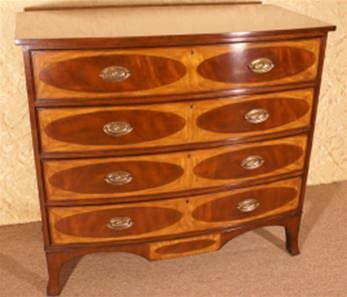 Floor Sample, Leighton Hall Bow Front Chest, Mahogany Chest of Drawers, Retails $4000. 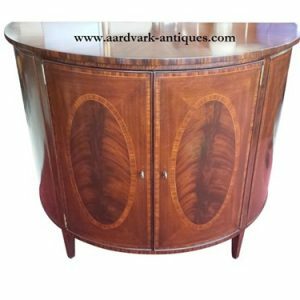 Beautiful cathedral Mahogany top, and oval fields of swirly crotch Mahogany surrounded by Prima Vera on the drawer fronts. 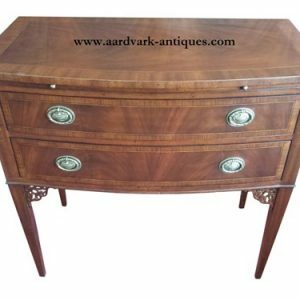 The four drawers are Oak lined and dovetailed, complete with solid brass hardware and locks. Measurements: 21.5″D x 42″W x 37″H. As with any floor sample, there may be an occasional scratch or nick. We photograph any we find and put it in the ad. We buy entire estates and showrooms passing the savings on to you. 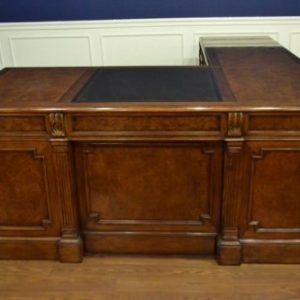 If you are not picking up at our Oakwood, Ga. store please call us at 770-534-6611 for a shipping quote. Subject to availability. Please call us for availability at 770-534-6611 before purchasing. Please call us for availability at 770-534-6611 before purchasing.